The orangutan belongs to the group of primates known as great apes. The indigenous Dayak people of Borneo tell an old legend that the orangutan was originally a human who pretended not to be able to speak and climbed up the trees to escape having to work. 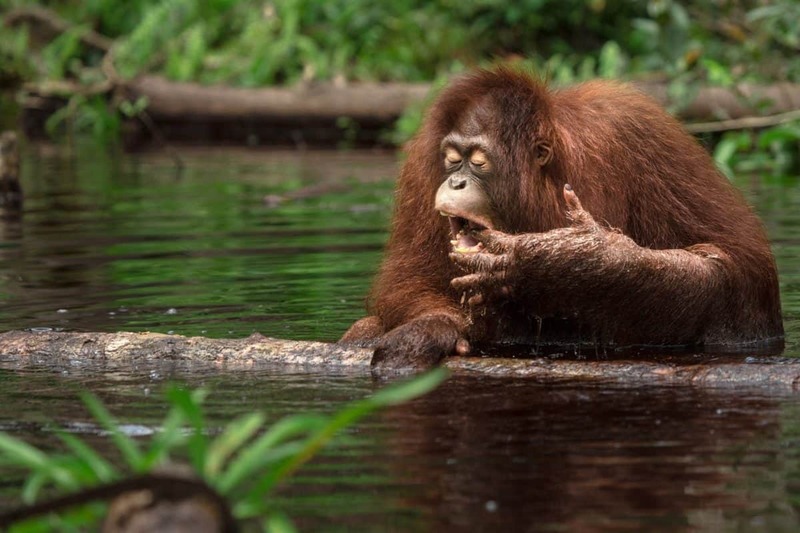 The name 'orangutan' originates from two different Malay and Indonesian words: 'orang' (human) and 'hutan' (forest). Orangutan thus means 'human of the forest'. The orangutan shares no less than 97 percent of its DNA with humans. They therefore share many physical similarities with humans. Orangutans live exclusively in Sumatra and Borneo in Southeast Asia, and it is the only great ape found outside of Africa. Until recently, we have known of only two different orangutan species. One in Sumatra (Pongo abelii) and one on Borneo (Pongo pygmaeus). However, the Tapanuli orangutan (Pongo tapanuliensis), a third orangutan species, was discovered in Sumatra in 2017. According to IUCN, all three species are critically endangered. The Bornean orangutan species, Pongo pygmaeus, is further divided into three subspecies: P.p. morio, p. wurmbii and P.p. pygmaeus. The remaining wild populations of orangutans live in the rainforest, usually in low-lying peat forests and other fertile rainforests on Borneo and Sumatra. They primarily live above the ground and in the forest canopy, and they are the largest arboreal mammals. Over 60 percent of the orangutan’s natural habitats in Indonesia and Malaysia have been destroyed over the last four decades. The largest remaining species of orangutans is the Bornean species (Pongo pygmaeus). However, recent estimates reveal that only between 50,000 and 100,000 orangutans live in the wild on Borneo today. 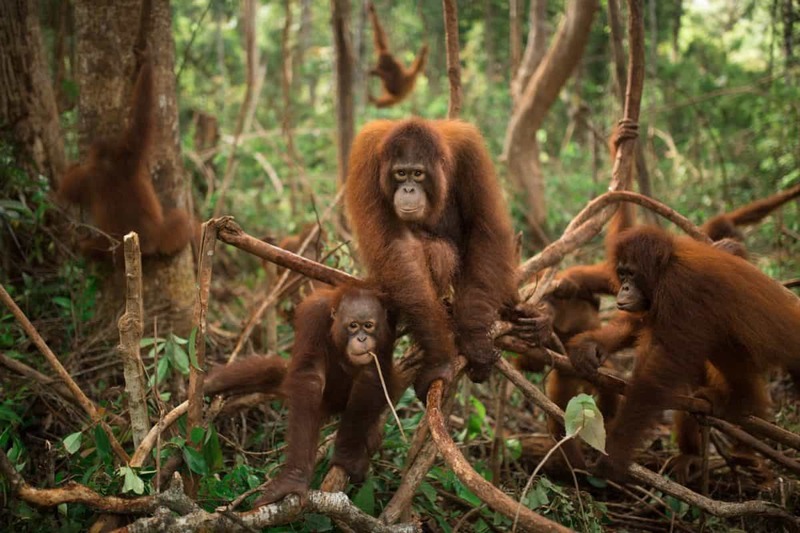 Even more critical is the pressure on the orangutans in Sumatra, where populations of less than 14,000 (Pongo abelii) and 800 (Pongo tapanuliensis) orangutans also face the overwhelming risk of extinction. The latest estimates from the IUCN indicate a general annual loss of 3,000-5,000 orangutans. Orangutans have the longest birth interval of any land mammal in the world. The females usually reproduce once every six to eight years, and like humans, the orangutan typically has only one offspring. Additionally, the orangutan infant is dependent on its mother for up to eight years after its birth before it acquires the skills necessary to survive on its own. Because of this dependency, the reproduction cycle of the orangutan is slower than in other primates. A wild orangutan can live for up to 45 years, and an orangutan in captivity can live for up to 60 years. Orangutans are one of the closest human relatives in the animal kingdom, and humans and orangutans share 97 percent of the same DNA. When a male orangutan is nearly fully grown around the age of 8-10, it develops the characteristic flappy cheek-pads known as flanges protruding from the face. The larger the flanges, the more dominant the male. Orangutan males can travel over long distances and they live isolated from other males. Orangutans have a long infancy. They cling to their mothers and are transported on her back for the first years of their lives. The orangutan is nursed by its mother until the age of eight, which is the longest nursing time in all mammals. The females live alone or in small groups of closely related individuals, and they often remain in the same forest area in which they were born.